Q: How far is Rosen Inn International from the airport? A: Rosen Inn International is 12.5 miles, about 20 minutes, from the Orlando International Airport. 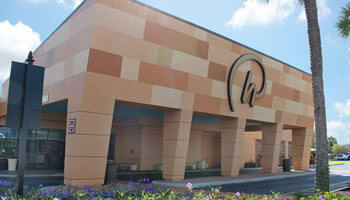 A: Rosen Inn International is 2 miles from the Orange County Convention Center. Q: How close is Rosen Inn International to the major theme park attractions? A: Rosen Inn International is 2.3 miles from Universal Orlando Resort™, 3 miles from Aquatica®, 3.8 miles from SeaWorld®, and 7.6 miles from Walt Disney World®. For more attractions and distances, please visit the Attractions page. Q: How can I obtain tickets to attractions like Universal Orlando Resort™, SeaWorld®, and Walt Disney World®? A: Our Guest Services Desk is happy to assist guests with purchasing attraction tickets. You can also check out our packages to see if we are offering any room plus ticket deals. Click here to purchase tickets online through the hotel. Q: Does Rosen Inn International offer shuttle service to the airport and area attractions? A: Rosen Inn International offers free scheduled shuttles to Universal Orlando Resort™, and SeaWorld Orlando®; scheduled shuttles to Walt Disney World® theme parks are available for a nominal fee. Reservations for all shuttles are required and must be made in person at the Universal Partner Hotel Vacation Planning Center one day (24 hours) in advance and up to 30 minutes prior to departure. Rosen Inn International can arrange airport shuttles for a fee. A: Check out the Theme Park Events and Central Florida Events pages for up-to-date ideas on what’s going on around town and at the theme parks. Another excellent place to search for suggestions is on the Blog page. A: Rosen Inn International has meeting space perfect for your intimate wedding, family reunion, special event, and group gathering. We have special group discounts including room blocks, discounted guestroom rates, and other perks. Contact the Director of Sales for more information or submit a Request for Proposal. Q: Is Rosen Inn International rated by AAA? A: Yes. 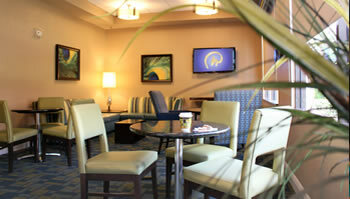 Rosen Inn International is a AAA Three Diamond rated hotel and recognized as a Universal Partner Hotel. A: Rosen Inn International offers a variety of on-site restaurants, as well as light and to-go meals and snacks in our Lite Bite Mini-Market & Deli. Explore these dining options on the Dining page. A: We have a Kids Eat Free Program for children under 5 with each paying adult at the Fountain View Restaurant. Visit the Guest Services Desk for restrictions. A: We have two seasonally-heated and non-smoking swimming pools, a children’s wading pool, video arcade game room, children’s playground, outdoor walking areas, and Topsy Turvey Lounge offering nightly drink and food specials with a side of great entertainment. A: Yes! Pets are most welcome. For the safety of our guests, employees, we ask guests and their accompanying pets follow a few basic rules and guidelines. Please check with the hotel for a full list of guidelines or read the online Pet Policy. Q: Do you have non-smoking or ADA-compliant rooms available? A: Every guestroom is non-smoking. There are designated smoking areas outside near the guestrooms. ADA-compliant rooms are available upon request. A: Every guestroom comes with mini-refrigerators, microwaves, single-serve coffee maker, iron and iron board, hairdryer, and more. Baby cribs are provided free upon request and an extra rollaway bed may be added to your room for a small daily fee. A: Absolutely. Contact the hotel’s sales department for a complete list of specialized packages and services to create a personalized experience. We can help with a variety of in-room gift baskets, treatments, flower arrangements, candy, and chocolate spreads. Prices vary for extra amenities. A: Rosen Inn International offers free, 24-hour-secured, gated parking with plenty of room for buses and RVs. A: Yes. Rosen Inn International has several coin-operated self-serve laundry facilities located throughout the hotel. For valet dry cleaning or laundry service, please contact the front desk. A: Rosen Inn International accepts Visa, MasterCard, American Express, Discover, Diners Club/Carte Blanch, Encore, and JCB. Q: Does Rosen Inn International offer business services? A: Faxing, copying, and package shipping services are available at Rosen Inn International’s Business Center. Please visit the Business Center for policies and a detailed list of services and fees. Package handling services available for a fee.